We at Vocal Evolution, first and foremost would like to say thank you to the BHA Council, the Novatones and all the helpers and volunteers in Newcastle last month for a fantastic convention. We had a great time. The organisation was great. The members of Novatones were very helpful and inviting. Thank you. We are extremely proud to be crowned the 2016 BHA Chorus Champions. We had a bumpy year with lots of changes and close calls. We hope you enjoyed what we presented on the stage on the day. Thank you everyone in BHA for allowing us to perform and compete at Convention. It wouldn’t happen if everyone didn’t travel to convention every year. What’s next for VE. We are actually about to begin rehearsals for the 2017 Fringe Festival in Perth. We will present our show Funhouse - a fusion of barbershop, cabaret and burlesque, with a little help from a Perth based Burlesque troop. We are extremely excited to put this together. If you are around Perth in Feb 17, please come and have a look! We look forward to returning to Sydney next year for Pan Pacs and to hand over the baton as Champions to the 2017 Champions. We wish you all a fantastic Christmas and New Year and look forward to what 2017 brings! 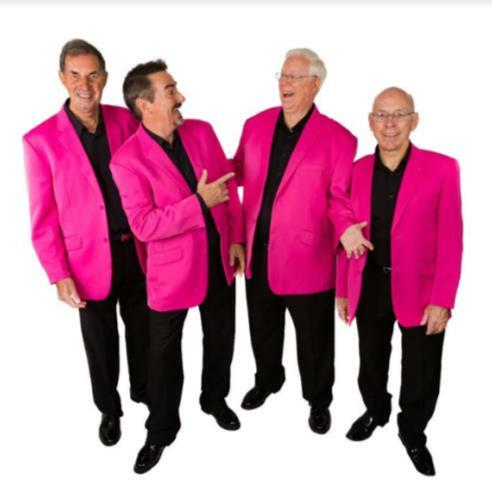 Like all other choruses competing in Newcastle, we had a busy September.Three weeks prior to the Convention in Newcastle, we had a weekend workshop with the four guys from Catalyst quartet which included time for some social singing with our coaches. The following weekend we sang at a retirement home enabling us to try out of our comp set prior to Newcastle. We had 2 quartets, First Edition and Something Good, appearing in the Thursday competition. Something Good, who had only been formed just prior to regionals, came a creditable 16th. Newcastle was our first national convention under the direction of our new MD Peter Donald. We were all excited to come in 6th place as well as winning the Most Improved Chorus Award and the Mature Age Chorus Award. Our singing score was our best ever. Going forward, the chorus now has confidence to improve on these results even further in Sydney. On the morning of the Newcastle contest, three of our members arrived early at the Wests Club dressed in our Victorian Era finery ready to perform our competition set which was a couple of numbers from the musical Oliver. ( One of us looked like a Hobo!) Like all competitors, we had to arrive in full costume for our performance. As our Chorus was first up we arrived early at 7am and thought we would go into the club for coffee. Arriving in the bistro area we asked if we could get coffee and some breakfast. There was one of the Choruses in the Bistro who had booked the bistro out for a pre-contest session which included great quantities of food and coffee laid on. As it was a private function, we could not be served so we happily left. As we were leaving, a lovely lady came up to us and told us that she was with the function and saw that we had been turned away and thought that we were homeless people. She wanted to offer us some of their food but didn’t want to offend us. We thanked her and politely declined. As we came on stage in our costumes , the penny must have dropped, obviously our costumes where authentic. We were still very touched by her kindness. 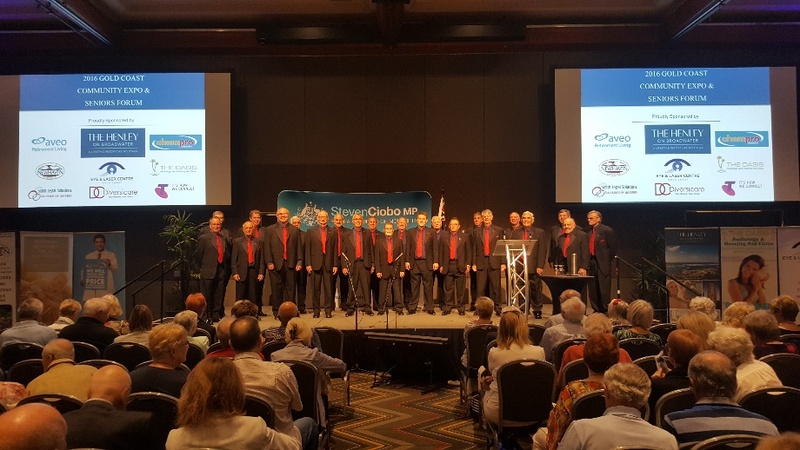 The Brisbane River City Clippers Chorus is celebrating its 25th anniversary, “the Clippers” were formed in 1991 to compete in the first National Convention of Barbershop Singers held in July 1991. At that time, we competed with just 12 singers. At one time, we numbered over 70, and now our membership is around 30, we are a chorus who sing for our own enjoyment, and perform at a variety of functions and events. The primary focus of our chorus is entertainment, but also we continue to strive to improve in our craft. This year’s convention in Newcastle provided us the means to measure our current level of skill and work diligently towards improvement. My passion for singing was deep but well hidden, only surfacing at church on Sunday. People often would comment on my singing from my seat, never on stage and with some encouragement (ok more than I'm willing to admit) I joined the church choir and signed up for their end of year Christmas production. This has being my only singing experience, but what I lack in experience I make up in for my passion to learn, grow and stretch. I longed to be in a quartet singing anything really, and it was my end goal to have a solo opportunity. My wife, who challenges me at the best of times, made it her goal to find a group or quartet for me to join, and she found the Brisbane River City Clippers in February of this year 2016. The BRCC is directed by Richard Reeve, who I feel makes it his personal passion and mission to invest and understand everyone personally and individually, adding direction, experience, and wisdom to us and our chorus. Not taking no for an answer, she signed me up and pushed me well out of my comfort zone to attend a Tuesday night Meet Up. Wow! was my first impression, as far out of my comfort zone that I was, this was beginning, the starting platform of my short amazing journey. Not only have I learnt so much in a short amount of time with both performing in, and watching everyone at our BHA National Conference. The friendship, and male camaraderie also has inspired and challenged me to be a better me. I know I'm very green (and one of the youngest in the group, at 46 years) but I am passionate and excited to start my own quartet and would love to be competing alongside the best at future BHA Nationals. A revelation I had at national which may be obvious to many experienced singers is the importance of quartets in a chorus. The BHA National Results showed the top 9 quartets were affiliated with the top 3 choruses and all but 1 of the top 19 quartets were affiliated with the top 5 choruses. It’s no coincidence that the choruses with more quartets are generally more successful because of the enormous amount quartetting teaches you about the genre. As my wife pushed me out of my comfort zone, I really encourage you ALL to jump out of your comfort zone and try singing in a quartet’s even if only in the safety and privacy of your own chorus. Most of us wont jump unless we have someone to jump with or we are pushed. Richard’s vast experience, range and talent resulted in his quartet winning third position at the BHA Nationals this year. It is this leadership and talent that I wish to thrive on to grow my own quartet. I am striving and super passionate for OUR chorus to be the best WE can be and encourage ALL of US to do whatever WE can personally to contribute to building on to achieve that. By jumping out of our comfort zones and promoting quartetting within our chorus, we have the amazing opportunity to attract and grow new people within the BHA community which will result in performing and entertaining our community’s with the amazing music we make. So who will jump with me and promote quarteting within chorus?. Novatones have had a very busy year preparing for, and organising, the 2016 National Convention. We had great pleasure in introducing many first time visitors to our region and hope they were equally pleased and will want to return again in the future. The comments from the locals and visitors alike were positive and made all the hard work worthwhile. We would like to extend a very warm thank you to all the choruses, quartets, and partners for helping make this convention a success. We had great support from Newcastle City Council and The Wests Group – nothing was too much trouble. We now look forward to Sydney in 2017. Always good to catch up with the familiar faces and meet new members from afar. We’re approaching the fun part of the year when we start our Christmas carols at the local shopping centres and entertainment strips. This is not only a good fund raising time but also a chance to get out and recruit new members simply by ensuring people get to see and hear us. Requests for Novatones to perform seem to increase each year and we’re reaching a wider market. Some of our members recently sang at a Newcastle City Council Regional promotion. From there we were approached to sing the National Anthem at the opening of the Newcastle Spring Racing Carnival. A great afternoon and very well received by the large crowd. Time to brush up on a few carols and maybe learn a new one or two. We at FSC would like to offer huge congratulations to all choruses at convention this year (especially to Vocal Evolution for their winning performance) and also to everyone involved in running such a fantastic event. It’s really exciting to know that the Barbershop community has such talent. We were thrilled to present our set to you and honoured to be named the silver medal chorus for 2016. We also want to congratulate all quartets, and give special mention to our members in Skyline, Gridlock, DQ, Enigma and Catalyst for all their successes. 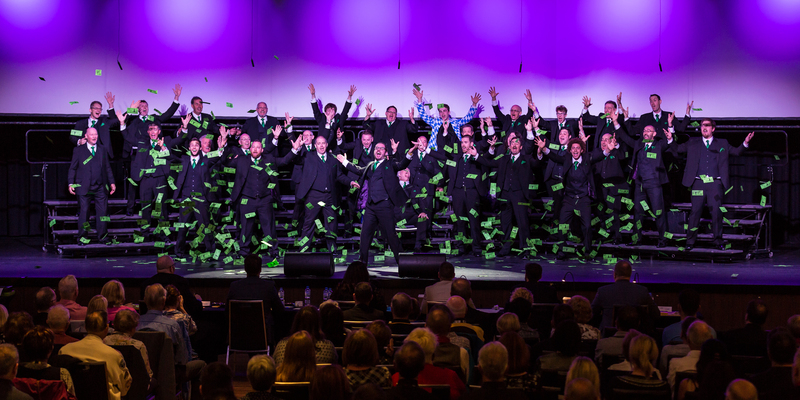 One of our convention highlights was performing with our good friends The Baden Street Singers. We were amused that we’d be presenting the same uptune (Steppin’ Out With My Baby) at this year’s convention but when we saw their presentation plan we knew we had to fit them together somehow. We in the Festival Statesmen love collaborating, and performing with such talented musicians as Baden Street at the Showcase was a truly special moment. Outside of convention we’ve still been busy. Mid-September we sent a sub-group to Melbourne to compete in Vocal Australia’s ‘AUSACA’ Championships. We’re pleased to report that we took out first place as well as some other awards such as Best Soloist (Jono Webb) and Best Vocal Percussion (Daniel Maley). We’ve also released a new music video (Magnificat) as part of the ‘Win A Composition’ international video competition for male choirs. There’s an audience favourite portion of the comp as well, so if you have a YouTube account please check it out at https://youtu.be/nWz3Gk02Ako and give us a thumbs up. We’ve got some exciting things planned for 2017, and we look forward to sharing them with you all soon. What a great Convention! Congratulations to all the other competitors, to the Newcastle Convention Organising Committee, host chorus the Novatones and to the BHA National Council for all their work in making the event a huge success. 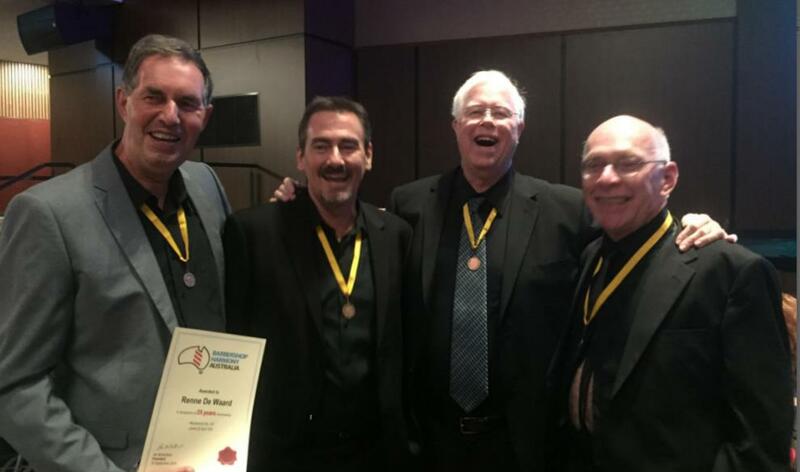 We are absolutely thrilled with achieving our best contest result in over a decade and have been overwhelmed by the positive feedback from our barbershop peers from all across Australia about our performances in both the Chorus Contest and the Chorus Corral. It is indeed a real pleasure to be able to share this wonderful form of music with you all. Having our quartet Pitch Please make it through to the Final of the Open Quartet Contest was the icing on the cake. For these four young men - all in their very first quartet - to place 10th in their first National Convention appearance was simply phenomenal. Congratulations Harry, Liam, Matt and Hugo! Keep an eye on these guys folks. On the Monday night before Convention we hosted a special Pre-Contest performance and social night for family and friends with the guys from Adelaide Vocal Union. What fun! 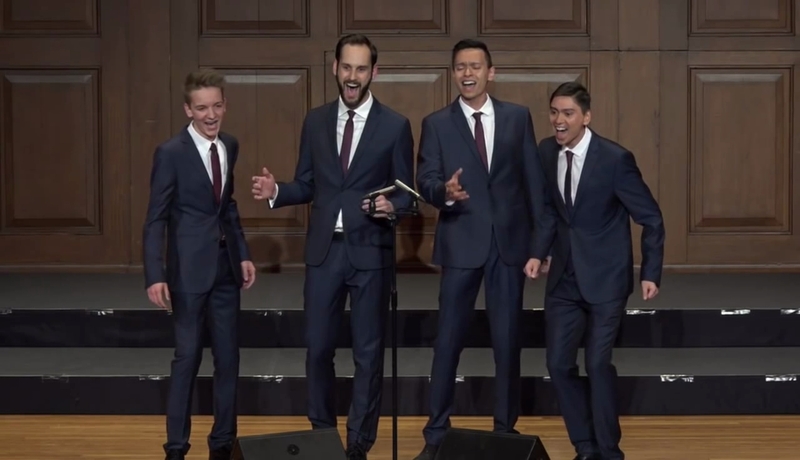 The choruses and all five competing quartets from both groups performed their contest sets in front of an enthusiastic audience, including a number of barbershoppers from Perth and Adelaide who were passing through Sydney on their way to Newcastle. Needless to say that the afterglow following was a great warm-up for the festivities to come later in the week! Thanks to Cam DuRieu and Kieran O’Dea from AVU for suggesting that we collaborate on this fabulous night. We need to do that again sometime! I've just returned from a really wonderful convention in Newcastle. As a Life Member of The Blenders is was a real honour to perform on stage with Jono and the lads and help to achieve a Bronze Medal Performance. An added bonus was singing a great set with Escapade and also a senior's Silver Medal set with Electric Canoe. On behalf of HAH which opted not to attend Convention this year, I offer sincere congrats to all participants, the winners and grinners (Yay Blindside & VE!!!) and to the Convention organisers and workers. The highlights for me included the Top 10 Quartet Shootout, the raised standard it took to make the Top 10 open quartet final and, the best Quartet evaluation sessions I've ever participated in. I've retuned to HAH inspired to continue our learning and performing journey. I’d be even more inspired if I could have purchased pitch pipes in bulk from the Harmony market Place to present to my Music Team. In the meantime, HAH has been busy rebuilding a core membership and growing a mixed barbershop and a'cappella repertoire. In September we were honored to provide the entire show for the University of Southern Queensland's Twilight Concert Series. We put on a great concert (according to feedback from an audience of 220 paying patrons) and came away well placed for the final build up to our annual signature event - The 9th HAH Singing Restaurant on Sat 29th October. Other recent singouts have included The Vintage Car Club and the Downs Syndrome Awareness Week Picnic in Queens Park. We have a steady trickle of potential members coming through the doors and I'm delighted with the quality of unit sound occurring as a consistent feature of our singing. Recent visits from Darin Drown and Kelly Shepherd left us with some wonderful gems we have since incorporated into our performance philosophy. In November we've promised ourselves some new Christmas repertoire which we'll perform at several local Christmas gigs and that, will round out a very busy 2016. Don't forget, if you ever find yourself in our wonderful garden city - Toowoomba, please join us at rehearsal each Thursday night at Toowoomba Philharmonic, 7 Matthews St, Harristown from 7pm. Coincidences do happen, and it was probably one of those that impacted on the numbers from Melbourne. The Newcastle convention fell on the same day there was, to the AFL, a rather important football game on at the MCG. It would appear that Victoria, and indeed many from other States, have not yet prioritised prominent events like football and barbershop. Unfortunately numbers were down and the Melbournaires became a small chorus once again. Nevertheless they equipped themselves well, especially with their presentation package put together by our own Clive Metz just two weeks before leaving. 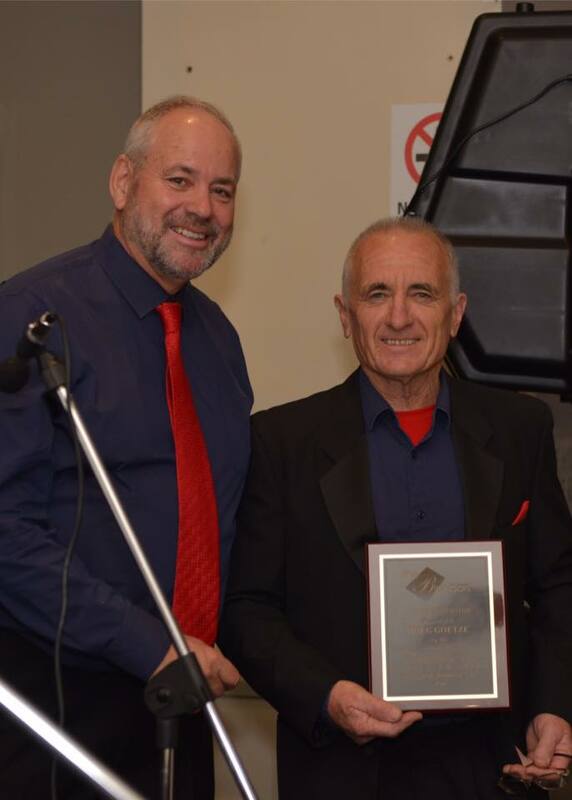 In fact, one of the judges, Joe Ceruti, MD of the Alexandria Harmonisers, mentioned our set-up in the Harmony classes that followed, as the most memorable event of the Chorus competition. Unfortunately, as our MD Ian Lushey said, we failed to put in a musical performance to match. Other highlights of the convention as seen by Ian were the amazing win by Vocal Evolution after they were unable to obtain copyright for their competition song just three weeks before they were due on stage, and had to write and learn a parody within those three weeks, and the headline act Forefront, who, apart from outstanding performances, were very generous with their time and work. One of the Melbournaires had been a member for four months, hence his first convention. He was in awe of the performers and was happy to mix and learn what he could about barbershop singing. As a bass singer, George was in his element when he met the bass singer of Forefront, an experience he will treasure. His love of barbershop has increased enormously, and younger members like him will embellish the chorus and improve its standing for years to come. 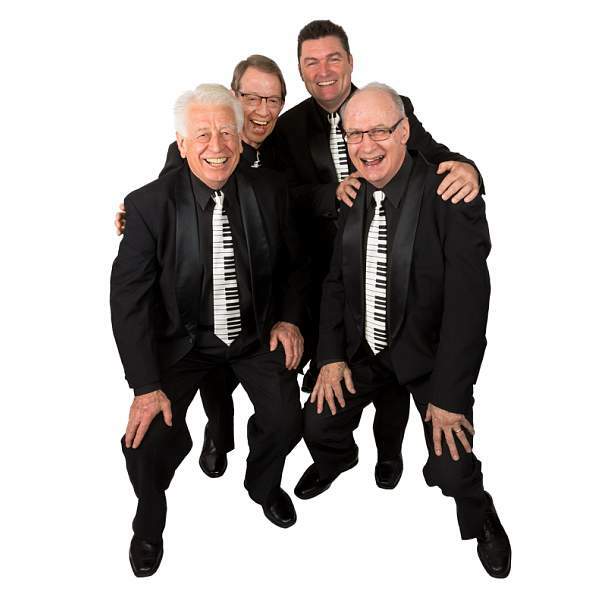 "Old timers" like our top quartet Boardwalk, also got much from the convention (apart from heavy bonding), so Newcastle and all its representatives can be very proud of the programmes it offered and the excellent impression it left with all participants and visitors. Job well done to you all. 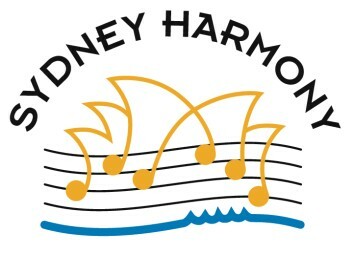 We would be remiss if we didn't start by thanking Brian Bleakley and his team at Hunter Harmony together with the BHA team for their hard work in organising a highly enjoyable and seamlessly run convention. We would also like to congratulate everyone who performed in any category for their contribution. A gold medal with Blindside and silver with Upgrade in the open quartets category. First place for The Blenders Youth Chorus may not seem like an achievement in a field of only one but there was plenty of achievement in just being there! A third place bronze for The Blenders was a first medal for quite a number of our singers, including ten for whom this was their first convention. The Chorus Breakfast, held before the chorus competition and a tradition that dates back to 1999, was the opportunity to award Life Membership to our popular President, Doug Goetze. The 107 attendees of the breakfast warmly supported this award. We once again sang at the convention church service which we have enjoyed participating in for many years. This gave us another opportunity to hear Forefront who of course sounded fantastic singing in church. A big thanks to Don Boyrgoyne for organizing this. The intensity of a Barbershop Convention allowed our use of the Facebook Messenger app to come into its own. This app, the use of which we had been trialling prior to Convention really came in to its own as a fast and fun communication tool between all our members. Now back to reality, we are looking at the future and have kicked off with a combined membership drive/celebratory rehearsal which was attended by over forty guests, many of whom are potential new members. As the largest BHA chorus with a current membership of over 80 we are constantly exploring avenues outside the barbershop community for new members to replace those that have moved on for whatever reason. Through our allied groups: Blenders Youth Chorus, Serotonin (Griffith university mixed student choir) and AB Patterson College choirs. We actively promote and encourage graduation from these groups to The Blenders. Via interest generated from gigs, community events, personal approaches, and newspaper articles. "Business as usual" means gigs are rolling in fast. The Thursday after convention we had a gig at Jupiter’s Hotel and Convention Centre to open a Seniors Forum hosted by Steven Ciobo MP. The enthusiastic audience of around 800 looked like recruitment material to our President who is always on the prowl for opportunities. We are eagerly anticipating The Blenders Awards Night, a tradition, dating back to 1996 has this year been rebranded as the Blenders & BYC Presentation Dinner and will occur on November 5th. The growth and success of our youth programmes through The Blenders Youth Chorus and its quartets has been rewarded by equal billing for this event: why not, these young men win most of the awards anyway! With our AGM fast approaching the Blenders are once again looking to include some new and some of our young members on Executive. With this in mind, last year we expanded the Executive to 16 members which, rather than being unmanageable has led to a new energy in the Executive with new ideas flowing through. 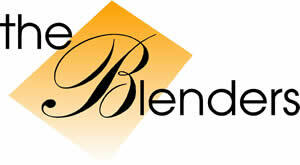 Our own club magazine "Blenders Herald", which has been produced in various formats since 1995 has been re-vamped for 2016 with a new editorial team and is now issued electronically to all members. Focussing on the fun side of chorus life, each issue is eagerly anticipated by all members. This is a story about Renee, Mike, Phil and Dave. 15 months ago, I moved to Perth and joined Vocal Evolution. I've been singing barbershop since 1973, and have always enjoyed the camaraderie and fellowship that singing brings to our lives. A couple months later, I was asked to sing with a few old farts to put a senior quartet together for the upcoming Regionals. It comprised of two basses and two baritones (I know, sounds painful doesn't it?). The worst part is the wanted me to sing Lead. I've been a die-hard Baritone for 42 years...how did I possibly do that? Well, we put a couple songs together and qualified for Melbourne in 2015. Okay, it was fun and the excitement of being on stage in front of your peers is second to none. I think we all thought that "110 and Counting" had competed for the last time. Regionals came around again in 2016 and we qualified for Newcastle (not hard to do really!). Then our tenor left for three months and I was in the US during August, so we had about three weeks to get it all together. What happened in Newcastle is what drove me to writing this boring article for the Newsletter. For our dear past President, Michael Donnelly - he really put in a huge effort trying to match our American vowels and singing style, because he wanted this more than anything. He wanted to perform two songs that made people think about what it's like to have four guys, whose combined years of singing barbershop is 110 years, and to hopefully bring them to tears as we sang a song about a little boy...the boy we used to be. I know that I had a tear in my eye at the end of it and many people came up to us afterwards and stated the same thing. And then of course, our Tenor Renee received a message from his grand-daughter telling him how proud she was, because he was now an Olympic Medalist! So, I wanted to publicly thank the guys for coming on this journey and for making this bronze medal that much more special, not just for the medal but for the experience and enjoyment of singing together. Because that's what it's all about, right?